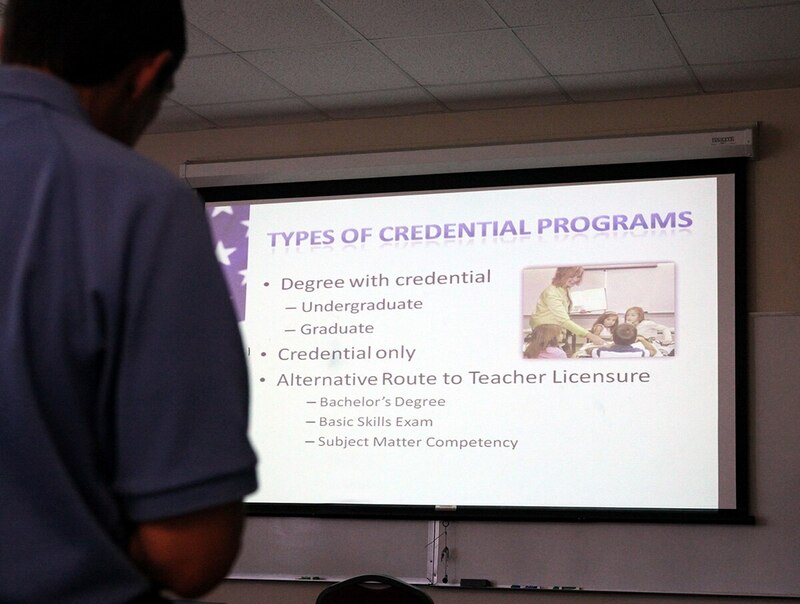 MONTGOMERY, Ala. — The military is aiming to ease Alabama’s shortage of teachers. Military officials are leading two efforts designed to increase the number of teachers in the state’s public schools, The Montgomery Advertiser reported. "In order to replace teachers that are retiring and those that are choosing not to go into the field, it's almost becoming a crisis to find good, qualified teachers in Alabama, especially where we are," said James Carter, superintendent in rural Greene County. About 15 percent of its teacher positions in the district are open, the Montgomery newspaper reported. "There's not a lot of people that want to come and live in areas that are isolated from the urban centers," Carter said. Peace has eluded retired Air Force Maj. Jeff Shelton for the better part of two decades. One of the initiatives designed to help schools like his is a Department of Defense program that was established in 1993 as a means to ease transition of military service members into civilian life. The program has put more than 20,000 veterans into classrooms nationally. The program used to be administered by the Department of Education. Stillman College became the education department’s first community partner in Alabama to handle the Troops to Teachers program. The college chose to focus its efforts on staffing Greene and Hale counties schools, and in October 2018, it was awarded a $400,000 grant to do so, the newspaper reported. Military veterans who go through the program are offered a stipend to cover the costs of education courses and licensing fees. They also get an incentive bonus for those that sign a three-year contract in a hard-to-staff school, up to a combined $10,000. "I think it can be a game-changer for the Black Belt and these schools," said Derwin Dubose, executive director of military and veteran programs at Stillman. The college, he said, felt it was imperative to serve Stillman's local communities. "We are looking forward to working with Stillman and the Troops to Teachers program," Carter said. "We are certainly hoping this will give us a head start on next year's recruiting, and we can utilize some of their experiences, and they can serve as role models for our students here." There are also legislative efforts aimed at certifying former Community College of the Air Force instructors to teach in K-12 schools. "CCAF's faculty development programs are closely aligned with the learning theory and instructional strategies found in colleges of education. The state recognizing CCAF's teacher training program would allow qualified airmen to begin teaching without sacrificing GI Bill benefits or paying out of pocket for an additional education credential," Dubose wrote in a letter to Gov. Kay Ivey's office this month. Dubose and other Air Force leaders are meeting with the education department and the governor’s office in early February to discuss the legislation’s details and potential.